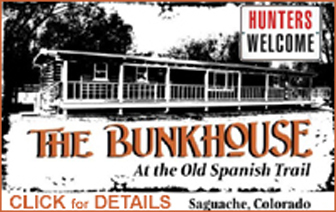 Art Festival in Saguache Today! The 8th Annual Saguache Art Festival will be held today Saturday, Aug. 19 from 10 a.m. to 5 p.m. This year’s festival will feature more than 20 artists and crafters, with music and food throughout Downtown Saguache. 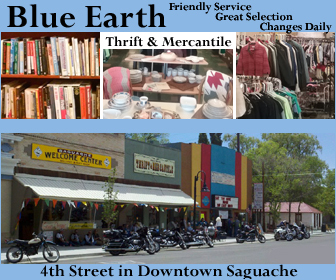 The Saguache Arts Festival will be held Saturday, Aug. 19 in Downtown Saguache. 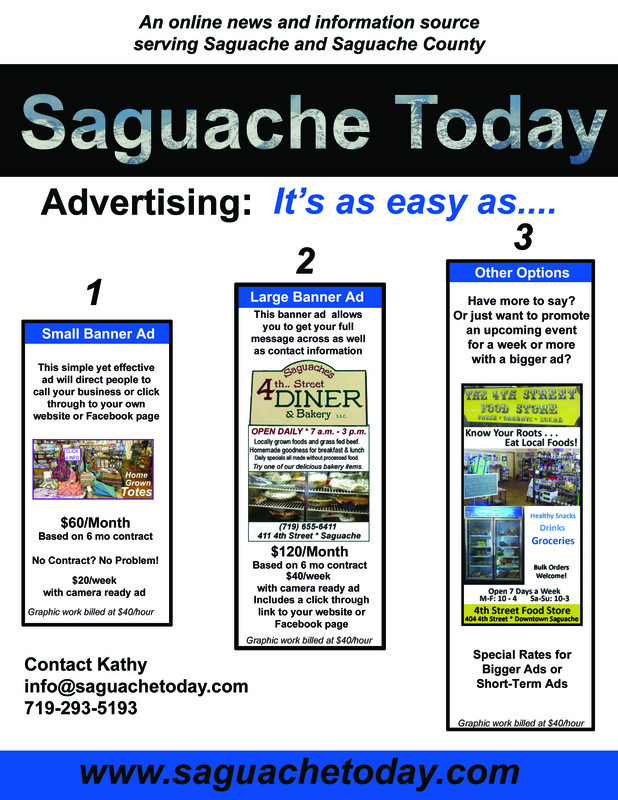 Saguache Art Festival maps will be available throughout Downtown. 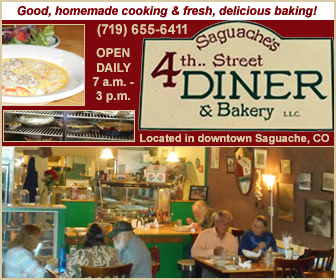 The Saguache Hotel will display art and antiques, 4th Street Diner will feature local artists and always amazing pie. Antiques Etc. will have eclectic antiques and local glass art. The Fentons will do a live pottery demonstration at their studio on San Juan around the corner from the Village Pub, serving up pizza, pasta and a full bar. The Magpie features Judith Page’s mixed media artwork and artifacts from Africa and the Middle East. The Range will exhibit painting by Gaby Wolodarski, an artist from Montevallo, Alabama. 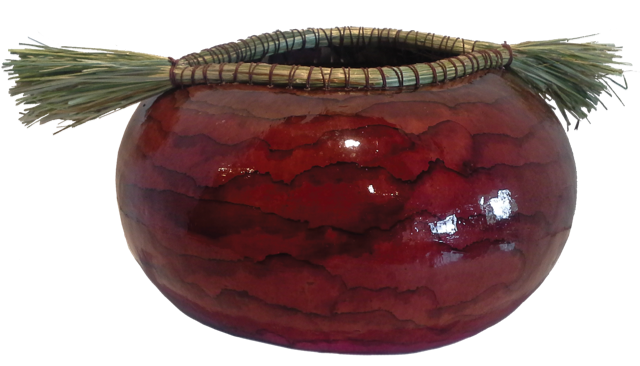 Around the corner visit Smith Market Gallery to see the work of Byron Williams, maker of baskets and embellished gourds. Across the street from Smith Market is Teri Rill’s studio, with a tree trunk carved into a bouquet. More artists and crafters will be set up at tables throughout the Downtown area. 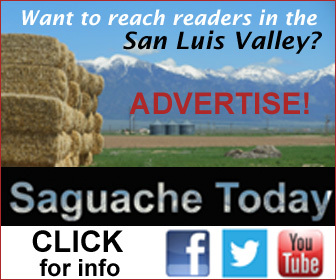 The 8th Annual Saguache Arts Festival is sponsored by the Saguache Chamber of Commerce. Saguache artist Kelsey Pedersen Photo: June Savage. Visit Hauck/Pedersen, in business in Saguache for over two decades, showcasing figurative expressionist art. Kelsey Hauck displays paintings, collage, sculpture, 100’s of works on paper, and antiquities throughout her 1886 storefront building. Hauck has lived throughout the Southwest and has traveled widely in Europe. She came to Saguache in 1993 with her late husband Doug Pedersen. Pedersen and Hauck met in 1966 in New York City when he hired her at the Whitney Museum of American Art’s first Education Department. Both artists have a strong interest in philosophy, classical music, education, and organic food. Their artwork deals with the human condition. For the serious art collector the journey to this 100 year-old mercantile building provides a face to face interaction with the art and the unique environment in which it was created. So next time you’re downtown, be sure to stop in and see what people have been talking about for years! For art-lovers wondering about the genesis of Saguache artist Judith Page’s colorful, and often whimsical artwork, the answer can be traced to a naughty childhood habit: coloring in the wallpaper. Artist and owner Judith Page writes up the receipt for another satisfied customer at the Magpie Gallery located in downtown Saguache Today. “Yes, I got caught doing that on more than one occasion,” recalls Page during a recent visit to the Magpie Gallery at the corner of 4th and San Juan. But perhaps that childish indiscretion was more the result of the artist’s self-described upbringing in a “poor” section of Washington, D.C., rather than a desire to deface her girlhood bedroom. After all, most artists work with what they have, right? Judy’s signature style is the use of bold, primary colors to illuminate fantastic imagery. However, these days Page’s meager beginnings seem as far away as her birth place, and nowhere is that more apparent than in her Magpie Gallery. From the array of colors used in Page’s mixed media illustrations, to the cross section of textures in the glass and wood beads adorning the windows and walls, as well as the hand-woven decorative baskets and rugs, visitors tend to forget they are in downtown Saguache! Page has been producing & selling her artwork in the San Luis Valley since 1998. According to the Magpie Gallery website: Judy’s signature style is the use of bold, primary colors to illuminate fantastic imagery. And if Page’s art helps people to see the world a little differently, then her partner Dean Coombs’ African collectibles help bring the world to the corner of 4th and San Juan. In fact, it’s that deep sense of texture that visitors to the Saguache art studio connect with the moment they enter, producing that childhood desire to run one’s hands across the rows and rows of one-of-kind beads. 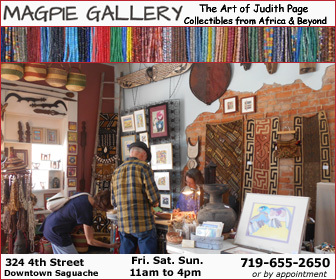 And while many in the San Luis Valley know the Coombs name as the third generation printer and editor of the Saguache Crescent, Dean has been collecting African beads and ethnographic artifacts for more than 20 years, much of which is on display and/or for sale at the Magpie Gallery. As one art enthusiast expressed during a recent visit, “I’m surprised to see this kind of African collection in the middle of nowhere; it’s lovely!” And no doubt the word has gotten out, as collectors from around the region now seek Coombs out because of his rare and diverse collection of art, particularly his vast selection of high quality beads. Come and see one of the most unique art shops in the San Luis Valley for yourself; the Magpie Gallery is open during the days and times listed below. 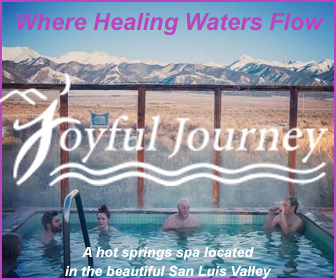 And remember that Saguache’s 8th Annual Saguache Art Festival is happening this Saturday, Aug. 19 – do you need a better reason to stop in to Saguache Today? The Magpie Gallery is open Friday, Saturday and Sunday from 11 a.m. to 4 p.m. or by appointment. (Closed for the winter from January – April except by appointment). 324 4th Street, downtown Saguache Colorado. 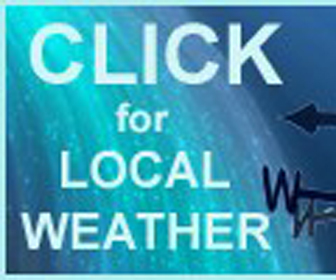 Call 719-655-2650. The Magpie Gallery stands as an anchor to the ever-growing arts and cultural district in downtown Saguache. Business is flourishing on 4th Street! 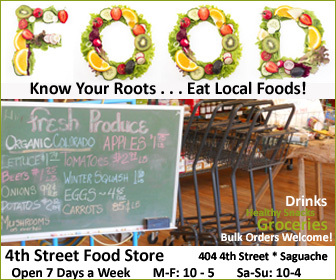 Saguache’s Byron Williams Creates Gourd-eous Art! Saguache artist and owner of the Smith Market Gallery, Byron Williams has a gourd-eous way of expressing his creative side. Williams has made baskets out of many materials, most frequently basket reed which is a standard basket making material. He has used grapevine, honeysuckle, tulip popular bark, Siberian Elm bark as well as rawhide, wool rovings and yard, paper and fabric. His talents are shown in a wide variety of baskets from traditional to the uniquely creative freeform styles. Byron runs the Smith Market Gallery at the corner of 5th and Denver in Saguache and will be one of the featured artist during the 8th Annual Saguache Art Festival this Saturday, August 19. Williams’s exhibit will have examples of his work, going back 40 years including baskets and gourds of many patterns and styles. Gourds are used for making everything from baskets looking like sculptures to masks and are part of his large collection of art. The art work is accomplished with the use of design itself to the unique painting the color with various dyes and wood varnish, antlers, carving, wood burning and other embellishments. He states that he likes to clean each of the gourds so he “becomes familiar with each one.” Each piece is a one of a kind; just like the artist! Falling Rock. Watch for Falling Rock. 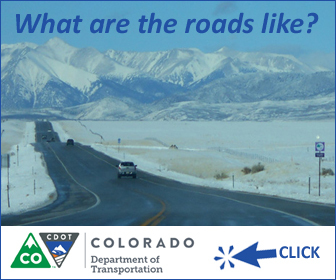 The signs can be found all along Colorado highways and beyond. While most believe that they are cautionary indicators of unstable terrain, there’s another story that many have not heard. This is the story of Princess Falling Rock and the never-ending search to bring her back home. The story begins in the rich and fertile San Luis Valley, a unique area where the Sangre de Cristos and San Juan Mountains appear to face off in a dramatic display of scenic beauty. It’s here that Chief Rock established his summer camp for thousands of his people who would hunt and fish during the warmer months, hoping to reap a harvest big enough to take them through the long winter. It was also in this valley that the Chief’s cherished daughter was born. However, the much anticipated event was accompanied with such pain and trembling that it shook the mountains, causing huge boulders to come crashing to the ground as his daughter found her way into this world. Ultimately, the blessed event left his wife dead after giving birth. The circumstances surrounding the arrival of what would be Chief Rock’s only child, were so significant that he appropriately named her Falling Rock. While the Chief’s grief over the loss of his wife was unbearable, the love he had for his beautiful daughter was unmatched in all the land. He adored Falling Rock. As a young girl he would take her into the mountains and teach her everything she needed to know about living and surviving in the rough mountain terrain. By the time she was a young woman, her legendary mountaineering, hunting and fishing skills were unmatched only by her beauty. One summer, the Chief decided it was time to find a husband for his beloved Falling Rock, a man worthy of his daughter and his legacy. Many warriors and brave men came before the Chief to prove themselves worthy, but his daughter was not interested in any of them. By the end of that summer the highly sought after princess went off into the woods to escape the fray of young men who sought her hand in marriage. She was never seen or heard from again. Chief Rock’s grief was enormous and he refused to leave the summer camp without his daughter, bearing out one long cold winter after another. He cried out for his beloved Falling Rock as he criss-crossed the unforgiving terrain in search of her. Over time, the region saw changes and more people moved in and began to settle the area, bringing with it what is now part of the present day highway system. Toward the end of his life, Chief Rock negotiated with state transportation officials, allowing them access to build roads through his traditional hunting grounds, but on one condition. To help in the never-ending search for his beloved daughter, signs were to be posted by the highway department as a reminder to all people who travel through the Rocky Mountains to “Watch for Falling Rock.” To this day, that agreement is still honored. So as you travel about in the inclement spring weather, perhaps dodging boulders that come crashing down on the roads this time of the year, keep an eye out for Princess Falling Rock. Maybe this is the year she can come back home.